Tuesday was a “very big day” for the Quinte Healthcare Corporation (QHC), chief financial officer and vice-president Brad Harrington said. 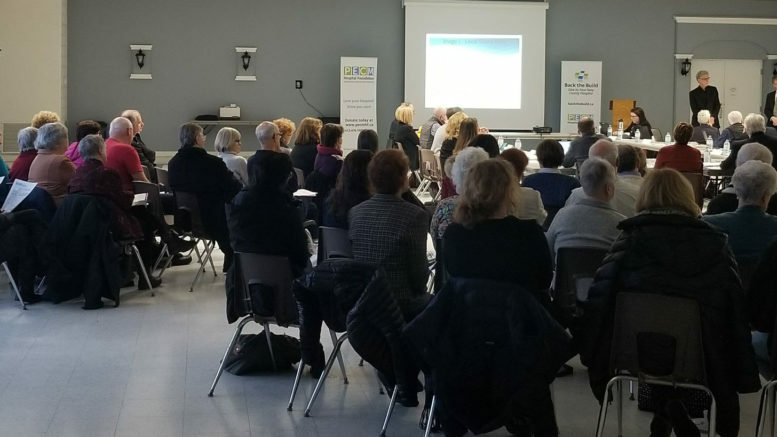 Before an enthusiastic crowd at Rotary Hall in Picton, the QHC board gave its blessing for the 364-page Stage 2 functional program for a new Prince Edward County hospital to go forward to the South East Local Health Integration Network (SE LHIN) and the Ministry of Health and Long-Term Care. Harrington said the plan, which was completed last month, includes preliminary room-by-room schematic drawings of the proposed hospital, the phasing of construction, associated equipment needs, and independent cost estimates. “QHC has worked very hard to put these plans forward. We believe we’ll send a very strong submission to government that’s an excellent plan in relation to what Prince Edward County and the Quinte region requires,” he said, adding he hopes further approvals will come within a reasonable timeline. As part of the presentation to the board, HDR principal architect Jason-Emery Groen laid out a two-floor hospital that will have a 24/7 emergency department and 18 in-patient beds (an increase from the current 12) situated on one floor, which Harrington said is ideal for integration of services. Groen also showed how the facility might be expanded if need arises. “We don’t anticipate that coming any time soon with a build planned by 2025 but if the need is there, we need to ensure there’s a way to expand the building we’ve constructed,” Harrington explained. The hospital will include the existing ambulatory clinics, diagnostic imaging and support services and include a seven-chair dialysis unit operated by the Kingston Health Sciences Centre. The cost of the 88,000-square-foot facility would be about $80.7 million. That’s increased from initial estimates due to the impacts of inflation on project costs. The community will be responsible for about $13 million — and the Prince Edward County Memorial Hospital Foundation already has pledges for $10.4 million. Harrington said QHC has been impressed with the local support. Harrington said eventually pledges will have to be turned into cash in hand as the project works through the five-step approvals process, but QHC is confident that will happen. The foundation’s executive director, Shannon Coull, was on hand for the vote and said she was “absolutely thrilled” QHC’s board believed the project was ready to proceed. She said donors could certainly feel the gratitude board members had for the job they’ve done to prepare for the next steps in the process. With regard to the plans themselves, Coull felt the site was well thought out. Prior to Tuesday’s board meeting, she took a tour of the hospital with board members and said that provided a great reminder that a new facility is badly needed. Harrington said Tuesday’s milestone comes as a result of years of work with more than 100 leaders in the hospital working together. Seven different planning teams — each representing a different aspect of the hospital’s operations offered input. An advisory team guided the steering committee with representation from the Prince Edward Family Health Team, the hospital’s auxiliary and foundation, and County council. SE LHIN chair Paul Huras worked directly with that team to ensure there would be one voice conveyed to the government about the need for the facility. With the board’s approval, the SE LHIN must also endorse the functional program before it moves to the ministry. With Huras’ involvement, Harrington said he expects that will be granted. Typically, he said once the ministry sees the documents, questions usually are raised within a couple of months. From there, QHC will work collaboratively with ministry staff to secure approval of Stage 2. Following that, they’ll move on to more detailed preliminary design drawings to produce specs for bidding. QHC is hopeful the project will be ready to enter its construction phase by 2021.